The pancreas is a glandular organ that secretes digestive enzymes and hormones. 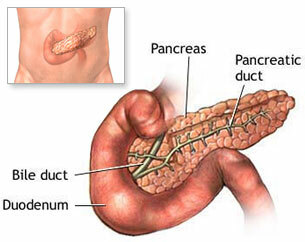 In humans, the pancreas is a yellowish organ about 7 inches (17.8 cm) long and 1.5 inches. (3.8 cm) wide. The pancreas lies beneath the stomach and is connected to the small intestine at the duodenum. The pancreas produces the body's most important enzymes. The enzymes are designed to digest foods and break down starches. The pancreas also helps neutralize chyme and helps break down proteins, fats and starch. Chyme is a thick semifluid mass of partly digested food that is passed from the stomach to the duodenum. If the pancreas is not working properly to neutralize chyme and break down proteins, fats and starch, starvation may occur. The pancreas contains enzyme producing cells that secrete two hormones. The two hormones are insulin and glucagon. Insulin and glucagon are secreted directly into the bloodstream, and together, they regulate the level of glucose in the blood. Insulin lowers the blood sugar level and increases the amount of glycogen (stored carbohydrate) in the liver. Glucagon slowly increases the blood sugar level if it falls too low. If the insulin secreting cells do not work properly, diabetes occurs.